This quilt was another challenge from my next door neighbor - the same one who challenged me last year to do a TARDIS quilt. Her request - the Millennium Falcon. After much googling and pondering and wondering - I came across a poster by an artist named Szoki that would serve as my inspiration. Connecting Threads provided the perfect fabrics to paint my picture, and I set to work. This project was made in three parts. 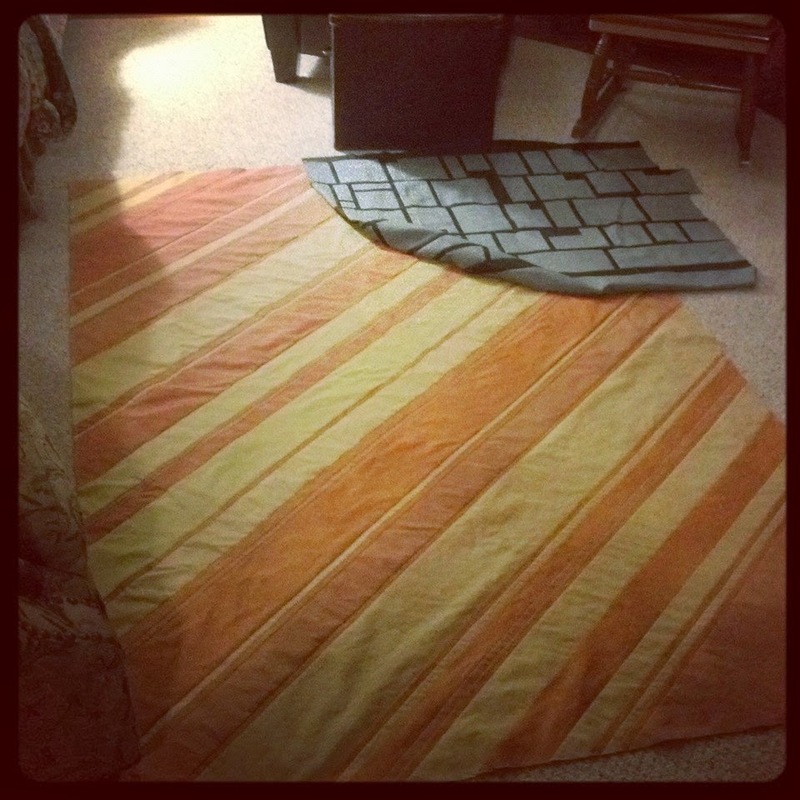 First I determined the finished size of the quilt (62x84) and cut a muslin rectangle a bit larger than that. I then started attaching the rust colored strips to that foundation - stitching, flipping, pressing, basting raw edges, then repeating - and repeating - and repeating. That took a VERY VERY long time!! And as I worked and added, the quilt got heavier and heavier. I was essentially working with the entire quilt body right from the beginning - and my shoulders felt it on this one. The second part was making the Death Star. That was pretty easy, actually. I looked at a number of pictures and art of the Death Star online, and then just pieced together my impression of what it should look like. I was going for a techno feel with lots of trenches going across. I was piecing the lower quadrant, so I didn't have to worry about the big dish/weapon area, as that is always shown up above the equatorial trench. That made my task easier. I made it bigger than it needed to be - because I knew I was going to cut it down and wanted to be sure I had enough to play with. 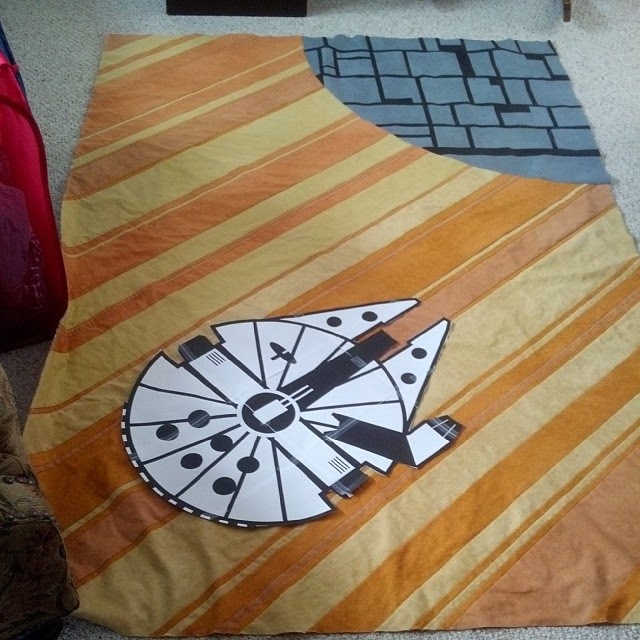 Once the Death Star was pieced, I made a giant pattern out of kraft paper so that I could cut the pie wedge out of the Death Star as well as out of the body of the quilt. 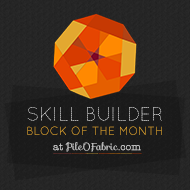 I stitched it just like a mini drunkards path block -only with a radius of 31"!!! That was a tense step -but it worked out very smoothly. The third - and most difficult - step was making the Falcon. Matt did his magic in Corel Draw, taking the outlines of the image from the poster and converting it into something I could use with fabric - plus making it much much larger. 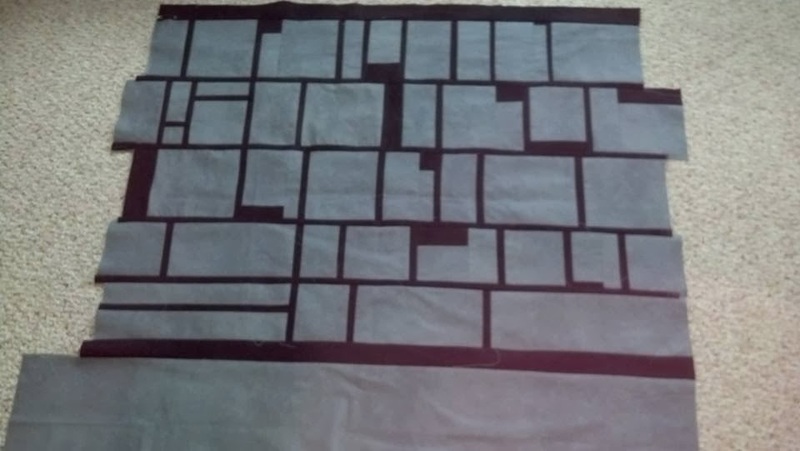 I printed it out on 9 sheets of paper and then pieced it together to make my pattern, first laying it out on top of the quilt to see if it was in the proportions I wanted. In these pictures you can various stages of my testing. You can also see the muslin foundation peeking out from the corner before the Death Star was attached. We played with various placements of the Falcon but ultimately Matt felt that we should have it "flying" along the lines created by the diagonal strips, so that is what we stuck with. 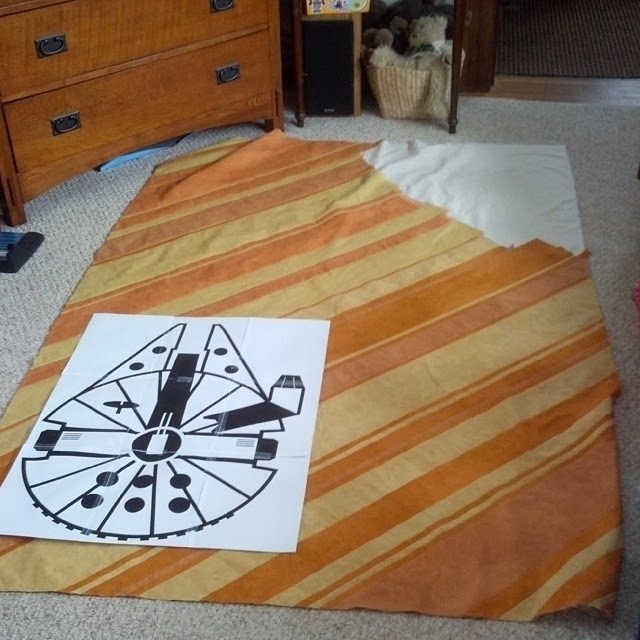 To make the Falcon, I first cut the full outline out of a dark dark blue fabric (actually leftover from the TARDIS!). I then took the various sections you see in white and traced them onto freezer paper - simplifying the design even more by making the sections larger. I ironed them on to the front of a slate blue fabric and the cut each one out. 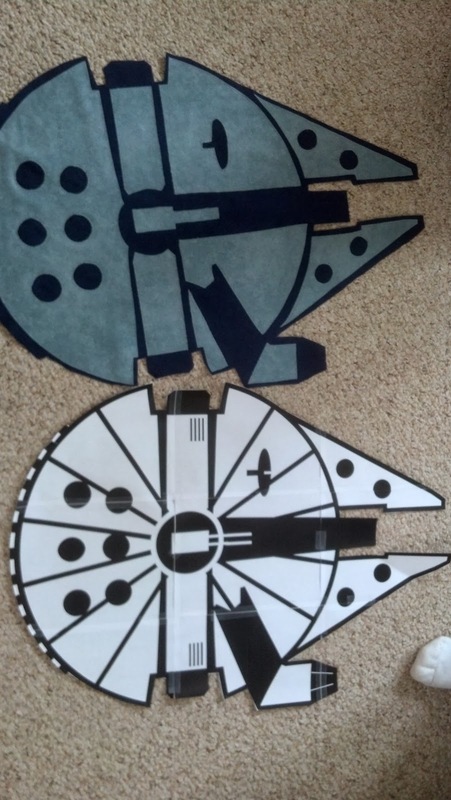 I did not want to add the bulk of fusible adhesive to this project -since the area near the Falcon would ultimately have 6 layers of fabric (backing, batting, muslin, rust strips, dark blue and slate blue) - so I used a product called Lapel Stick to hold the pieces in place while I stitched around each piece. It worked quite nicely and held them steady. I chose to do a raw edge applique because it is the "fastest hunk of junk" and I wanted to have that raggedy feel. Once the Falcon was done -the quilting began. 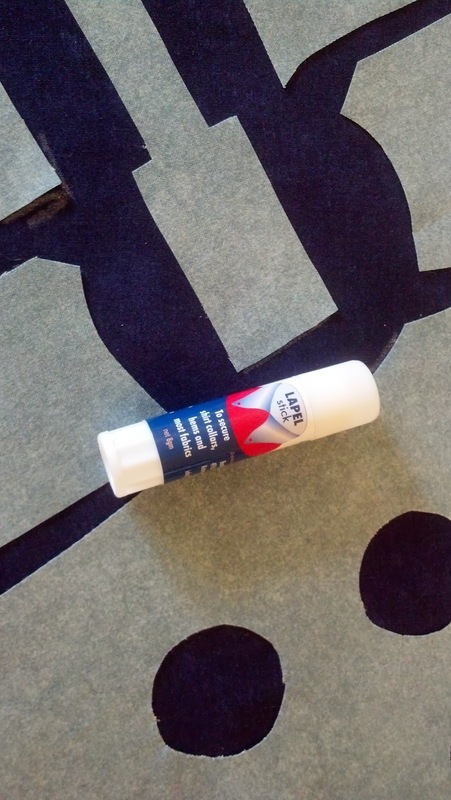 I worked on the diagonals first - doing many many closely spaced lines along the strips, in the middles, on the edges. Next came the Death Star - horizontal bands of quilting following the lines of the trenches. I like how you can see the Falcon on the back... and how much this one crinkled!! Each strip of fabric on the back represents a location in the original Star Wars trilogy - in order from top to bottom. This photo show the Death Star, Hoth, Asteroid Field, Dagobah and Cloud City. and then it was delivered. Truly a bit sad to see it go - but I know it will be loved. Sometimes quilt inspirations come from interesting places... or from interesting people. In this case - it was both. 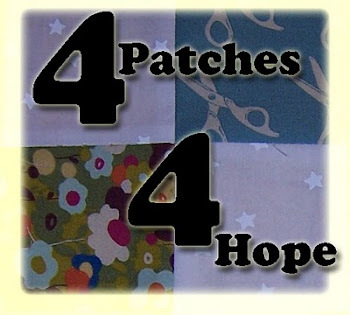 Last fall, a friend of mine from high school contacted me via facebook to ask if I ever sold my quilts. In the course of the conversation, he asked me if he could design the center of a quilt and have me take that, finish the design, and then make it as a gift for his wife. It sounded like a fun challenge - so I told him to email me his design. Well - it came to me in hard copy - and he had designed the entire top, including selecting the colors. "I got carried away a bit," he said... but I loved what he had come up with. I chose some tone on tone and mottled fabrics to work with to give the open spaces a bit of texture - and then I pondered this one for a bit while finishing up some holiday projects that had come first. Once we got into the new year - I got to work on this, including making myself a prototype (in orange, of course! )It took me a bit to work out some of the logistics - like the floating diamonds in the little side blocks (tutorial to follow) - and to get past my apprehension of having to quilt all that open space. A template, a Frixion pen, variegated Aurifil thread and a whole lot of patience -and we got that done as well. The name is a combination of my last name from when he knew me (Earl) and his last name (Thompson) -and the fact that it looks rather like a family crest. In actuality -his inspiration is surveyors targets! And I think this design is RIGHT ON TARGET!! !